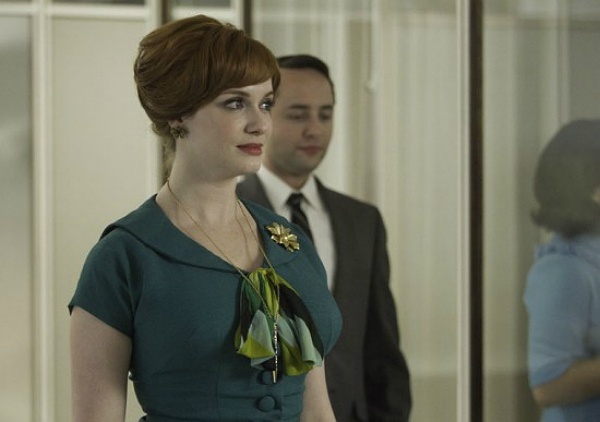 TV TALK: MAD MEN 5.11 “THE OTHER WOMAN” – FILM CRIT HULK! HULK BLOG! This season has been so interesting. In many ways, it seems as if Matt Weiner has made a decision to be less subtle and more direct in how the show explores its themes. That has worked to great effect sometimes (like with Megan at the audition this episode) and less well at other times (like with Peggy and her purse and her black coworker). Overall, I really dig it. I’m someone who thinks that the old nostrum “show, don’t tell” is really oversold. Sometimes really great art comes right out and tells. This might not be that direct, but Weiner clearly isn’t afraid to show the strings a little bit this season. I’ll confess to not 100% buying into the Joan plotline. I guess I just didn’t feel like it was true to the characters I know. (Also, I could have done without the broken refrigerator, which seemed like a really hamhanded justification.) But it’s all been fascinating.